There are always some days when you crave the taste of something that came in a ready meal packet. Yes, you read that right, a ready meal packet. I almost never buy ready meals, but I make an exception for Ashoka Punjabi Choley. 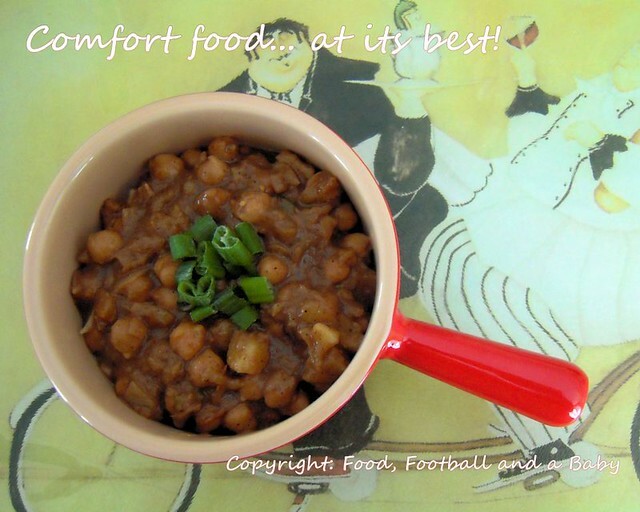 I love the taste of the plump chickpeas cooked in a spicy sauce, quintessentially Indian! However, since moving to Edmonton, I found that I very rarely have the chance to go to Asian supermarkets (which I haunted when we lived in England), which means my stock of packets of chole was sadly depleted. So, as necessity is the mother of cooking, I decided to get off my lazy backside and have a stab at making them myself. I make a version of chana masala, which is good, but its not Punjabi Chole. So I started looking around for a good recipe. I follow an amazing blog called 'A Mad Tea Party'. 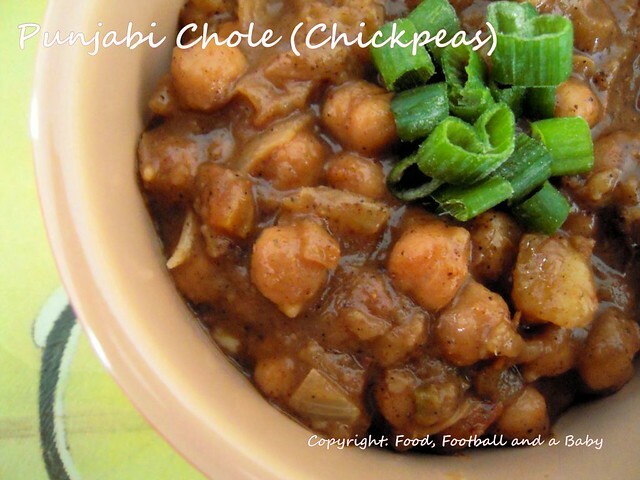 When I googled 'Punjabi Chole' the first hit was Anita's recipe. It looked awesome and after drooling for a while over the pictures, I hit my kitchen cupboards. I adapted Anita's recipe a little bit, as I did not have a few ingredients and my essential laziness meant that I certainly wasn't going to be organised enough to soak the chickpeas and cook them. I also had to leave my pressure cooker behind in England (sob, sob) so it would have taken a long time to cook them. So I went with tinned chickpeas and tomatoes. I also substituted a few spices as I had run out of a few (I really need to get to a Asian store soon!!) 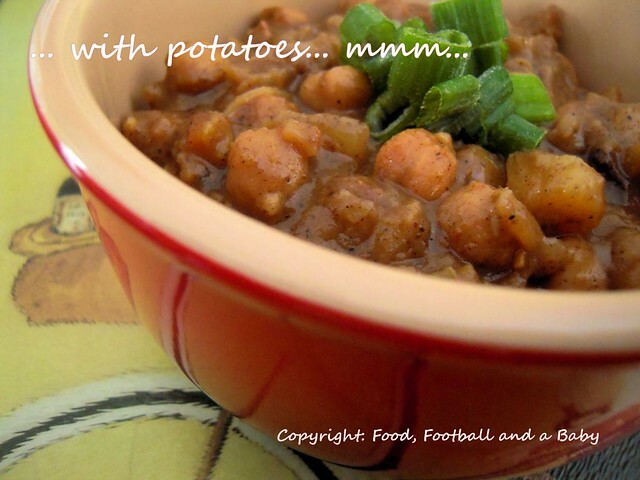 and added potato cubes to the chole to make them a bit more substantial. I also skipped the chilli powder and slit green chillies, to suit the spice tolerance level in our house. The dish is still fairly spicy, but Kay was able to handle the spice well, so I haven't bothered reducing the ground spice content. If you want it less spicy, just reduce the peppercorns which are the source of heat in this dish. Anita's dark roasting method, which I had never tried before, made a huge difference to the dish and the taste was very different to the chole you get in a restaurant. The end result was that this concoction tasted divine. Not super authentic (I highly recommend you try Anita's recipe if you want to be authentic), but still absolutely delicious! Just like the stuff from the packet tasted, but better (I know, just humour me, OK) It immediately became a new favourite in the house, and its freezable to boot, so a huge success all round!! 1 large potato, cubed into small dice, and boiled till just tender. 1 spring onion, sliced or handful of fresh coriander, chopped. Put all the spices into a heavy pan, and roast, stirring constantly, until they are almost black in colour. They don't have to be jet black, I roasted mine to a dark brown colour. Transfer to a powerful blender or spice grinder and grind to a fine powder. Note: You can double or triple the spice recipe, and store the ground spice in an airtight tin for use later as well. Of course, fresh ground spice does taste a lot better. In a pan, heat the oil, and cook the onion on a medium heat till soft and starting to brown round the edges. Add the ginger/ garlic and stir for an additional minute. Add the tomatoes to the mixture, and cook, stirring until the tomatoes are very squishy. Add the ground spice mix and salt to taste. Cook down, stirring for about 10 - 15 minutes, until the masala is fairly dry. Add the chickpeas, along with any water in the tin, and the potatoes, and stir together gently. Simmer for an additional 5 minutes. Garnish with spring onions or fresh coriander and serve with rice, roti or naan. 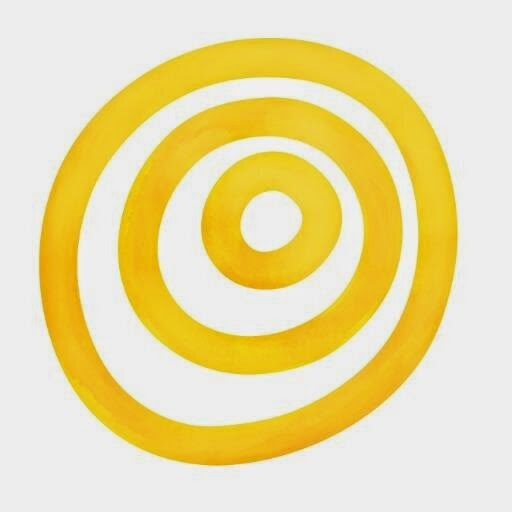 Thanks Chumbles, I finally figured that people don't necessarily have computers in teh kitchen, so looked around and made the recipes printable. The type of potato really doesn't matter here, as its cooked before you stir it in. I use Russet or Yukon Gold, as that's what we get here. I imagine Maris Piper would work well, but you could use any kind of mashing/ baking type of spud. I would probably avoid new potatoes, as they don't really tend to absorb the flavour of spices very well. I have at last cooked this recipe (sans the cardamoms - cannot stand them and can taste them through a brick wall) I cooked the recipe in double quantities and split it into 3, freezing two of the batches the following day. I brought the third batch to room temp whilst frying some mushrooms and fish in groundnut oil (thanks for the tip) until the latter had flaked; I also 'steamed' some carrots and asparagus (cutting the woody stalks across the width into 1-2 mmm discs). Added the chole to the fish and mushrooms for approx 1 min, then the carrots and asparagus for a further 1 minute and ate the lot at unseemly speed. Michelle, it's an awesome recipe and sooo tasty! I ate it with a 2007 Pinot Noir from South Island NZ. What a pig, eh!? But what a happy pig! Silly question, but tinned chickpeas = canned chickpeas, right?